Bindy was brought up on a dairy farm in Jersey and gained her early love of both painting and gardening from her mother. Art is in her blood - her Great Great Grandfather, Erskine Nicol, was a renowned Victorian genre painter. 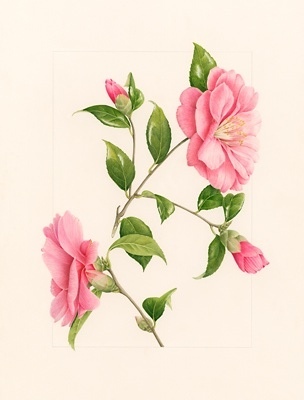 A keen amateur painter, Bindy's first formal lessons in botanical painting were in the 1990s with Anne-Marie Evans. She successfully exhibited at that time both locally and at The World of Watercolours. In 1997 Bindy and her family moved to a larger country house with a 5 acre garden and a dairy farm. For the next 10 years, during which she created and designed a beautiful walled rose garden, farming and gardening took priority to painting. 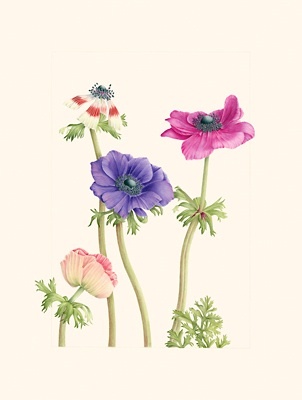 However, in 2009, she enrolled in the Diploma course in Botanical Illustration at the English Gardening School, at the Chelsea Physic Garden, graduating in 2011 with Distinction. Bindy likes nothing better than to paint the flowers, fruit and vegetables in her beautiful English garden.